CANBERRA, Australia, January 9, 2001 (ENS) - Australia and New Zealand are suspending the importation of foods containing beef or beef products from 30 European countries because of concerns over Bovine Spongiform Encephalopathy (BSE), commonly known as mad cow disease. The suspension went into effect Monday. Specified foods containing British beef have been banned from Australia since 1996 following concerns about the link between BSE infected British beef and the human variant of BSE, the fatal brain wasting Creutzfeldt Jakob Disease (CJD) and its newly discovered variant, vCJD. The diseases cycle through livestock and can infect humans when cattle consume feed containing meat and bone meal that is contaminated by other animals that have BSE. Without human intervention, cattle eat only grass and grains and do not consume meats of any kind. Announcing the temporary suspension, Australia's chief medical officer, Professor Richard Smallwood said, "It is becoming clearer now that more countries in Europe may be affected by BSE in their cattle. While the number of cattle involved in these countries is still small compared to the UK, federal health minister, Dr. Michael Wooldridge, has taken action, in conjunction with other relevant ministers to exclude these products from sale in Australia as a precaution." "The risk to the health of Australians from the consumption of these products is extremely small," Smallwood said, "however, we need to keep one step ahead of the BSE/vCJD situation that is causing great concern in the UK and the rest of Europe." Australian grocers being asked to introduce a voluntary withdrawal of all these products. Consumers are advised to discard any cans of food they may have in their cupboards that contain beef from a European country of origin. Managing director of the Australia New Zealand Food Authority, Ian Lindenmayer, is recommending that consumers check the labels on any imported foods they have and discard corned beef, luncheon meat, frankfurters and other products which contain beef with a European country of origin. Manufactured foods that could contain contaminated beef include meat flavorings, soups, meat pastes, pâtés, luncheon meats, filled pasta, sausages, canned meat, beef goulash and stock cubes. "There are small but significant amounts of these foods on the Australian market - around 1,000 tons per annum, which accounts for only 0.2 per cent of beef consumed annually in Australia. This food is imported almost entirely as canned or prepared food products. While there will be a cost to retailers who will be asked to withdraw the products from shelves and discard them, no retailer should be too badly affected. 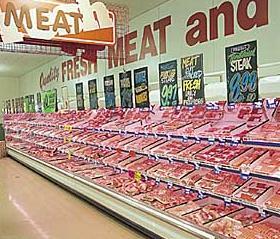 Foods already in transit to Australia will be prevented from entering the Australian marketplace. Australia and New Zealand have agreed that following the suspension and voluntary withdrawal of products from sale, a formal certification process will be established to assess future imports to ensure they are BSE free. Professor Smallwood said Australia and New Zealand have no BSE in their cattle, and assured the public that Australian and New Zealand meat products are the "safest in the world to eat." "For the most part we are only talking about specialty items sourced from beef in Europe where we cannot be certain of their BSE free status," he said. More than 80 people have died in Britain and two have died in France from BSE's fatal human equivalent, Creutzfeldt-Jakob Disease. On December 4, 2000, European Union farm ministers agreed to impose tough new measures to fight mad cow disease, including tightening controls on animal feed and excluding older cattle from the food chain. EU food safety commissioner David Byrne said the measures, agreed during emergency talks aimed at halting the spread of BSE, would boost faith in Europe's beef supply. 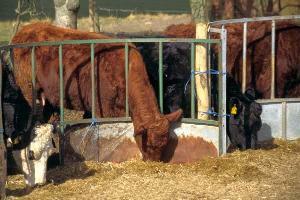 Ministers approved a six month suspension on using meat and bone meal in all livestock feed to begin January 2001. The European Union produces about three million tons of meat and bone meal every year. The Commission estimates it would cost three billion euros to destroy the material by incineration. "It will involve huge financial costs. But it is the price that must be paid to restore public confidence in our commitment to protect public health," Byrne said. But some UK scientists warned that the move in Brussels would leave Europe struggling to transport, store and destroy thousands of tons of ground-up cattle carcasses. At each stage of the process, infected waste could leak into the water supply, disperse into the air or be eaten by other animals, giving BSE more of a chance to spread to the public. At least five European Union countries imposed full or partial bans on French beef and cattle after French supermarkets disclosed in October 2000 they had unknowingly sold beef from a herd of cattle contaminated by BSE. To guide Australia's policy with regard to BSE, Professor Smallwood is looking forward to receiving expert, independent scientific advice on transmissible spongiform encephalopathies (TSEs) from the newly formed National Health and Medical Research Council Expert Committee on TSEs, that was established late last year. The group is chaired by Professor Graeme Ryan, a former dean of medicine at Melbourne University, and includes experts in food safety, communicable diseases, quarantine, blood, agricultural and veterinary science, epidemiology, and consumer interests. The committee will study the full range of TSEs, including BSE in cattle, scrapie in sheep, CJD and vCJD in humans and their implications for public health and safety. The committee will advise the Australian government on how best to deal with these emerging issues based on what Professor Smallwood calls "sound evidence and best practice." Lindenmayer said the Australia New Zealand Food Authority will be examining possible amendments to the Australia New Zealand Food Standards Code that mightd require exporting countries to certify that their beef products are free from BSE. The Australia New Zealand Food Authority has produced a fact sheet which is online at: http://www.anzfa.gov.au or http://www.anzfa.govt.nz. Is Mad Cow in Your Fridge? Mad Cow USA: Could It Happen Here? BOSTON (AP) -- Hundreds of thousands of Americans may get sick each year with salmonella poisoning caused by a strain of the germ that is resistant to five antibiotics. This strain has been a problem in Europe, particularly Britain, for several years. But until recently it was rare in the United States. It is suspected of causing even more severe illness than ordinary salmonella. A study by the Centers for Disease Control and Prevention found that between 68,000 and 340,000 cases of infection with this germ now occur annually in the United States. The estimate is rough because most food poisoning cases caused by salmonella never get reported. The CDC estimates that between 800,000 and 4 million people in all get sick with salmonella each year, and 500 people die. The highly resistant bug is impervious to ampicillin, chloramphenicol, streptomycin, sulfonamides and tetracycline. Most salmonella cases do not need to be treated with antibiotics. However, severe infections may require antibiotics, and can still be controlled with ciprofloxacin or ceftriaxone, at least for now. In Britain, salmonella immune to the five other drugs is also becoming resistant to ciprofloxacin. Dr. M. Kathleen Glynn and others who described the emergence of the drug-resistant salmonella emphasized the need to use antibiotics prudently, especially on farms, where much bacterial resistance to drugs is thought to have developed. The CDC report, published in Thursday's issue of the New England Journal of Medicine, was based on an analysis of data collected by local and state health departments since 1979. In an editorial, Dr. Stuart B. Levy of Tufts University School of Medicine in Boston noted that nearly half of the 50 million pounds of antibiotics produced in the United States annually is used in animals. Most of this is intended to make animals grow faster rather than to prevent or treat diseases. Experts believe that wide use of antibiotics promotes the evolution of bugs that carry genes that allow them to withstand the medicines.